7,765 sq ft Custom Built Luxury Home on 5+ Acres - Views for miles and miles! Stunning mountain views provide a backdrop to this luxury custom built 7,765 sqft. home situated on 5+ acres in McArthur Ranch. This home is a rare find located 1.5 miles from Rock Canyon High School, and just over The Bluffs from Park Meadows Mall. A grand entrance leads to the rear of the home with a covered outdoor living space perfect for entertaining, watching sunsets and storms roll over the Rocky Mountains. Convenient stair cases on either side of the house provide easy access to 4 bedrooms upstairs and a beautifully finished basement. 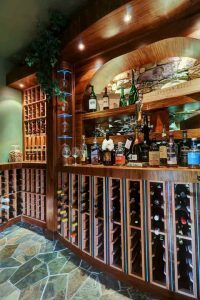 The Basement features a wine cellar, home theater, custom bar, pool table, home gym and spa-like bathroom with hot tub access. The second patio provides more spectacular views of the Rocky Mountains, the rolling hillside, fire pit and water feature. Heated concrete driveway leading to over-sized garages, one with 2 bays, the other with 3 bays and extended ceiling heights. Your dream home in Lone Tree, Colorado awaits! This home is a rare gem that doesn’t come along very often. Acreage, Privacy, Views, Wildlife and convenience to all the amenities the City of Lone Tree has to offer. Don’t miss the secret book case passage from one of the bedrooms to the game room; a child’s dream come true! 3-D Matterport tour, aerial video, and floor plans available at www.KunaEstates.com. Average utility cost and builder blue prints available upon request. Additional home features include: whole house intercom system, radon mitigation system, 2 new 50 gallon hot water tanks, three furnaces, two air conditioners, water softener, iPod docking stations, indoor/outdoor speakers and security system. Quebec to McArthur. Turn left onto McArthur Ranch Road, follow to Flatiron and turn left. Property is on your right hand side.